having reverted to the wild state, as from domestication. of or characteristic of wild animals; ferocious, brutal. It is a word that packs a punch and is loaded with many images or examples. Without even reading the description, the title alone drew me in for the creepy fall reading. Claire Cain is a city girl with a talent for uncovering the truth. Unfortunately, this talent drew her into a dark, cold alley surrounded by trouble one night and she barely left alive. Months later, she decides to travel to the small town of Peculiar, Missouri with her father on a sabbatical. She has healed physically, but the emotional healing is only just beginning. Getting away from the city where the ferocious attack occurred may just be what she needs . . . or not. The same day she arrives in town, another girl disappears and is later found dead. Claire uses her talent once again to get to the bottom of the mystery, but she is likely entering another dark, cold alley. Feral proves to be a wild ride. It is a psychological thriller that left me guessing until the end. It features the brutal turn of events that Claire's life takes. It adds to the eerie feeling when the pack of feral cats enter the story. It was a fitting choice to kick off my fall reading to get me in the mood for RIP reading . . . not scary, but definitely mysterious, suspenseful, and thrilling. ICYMI: Holly stopped by last week to share a video about her decision to set her story in Peculiar. Be sure to click on over and check it out! 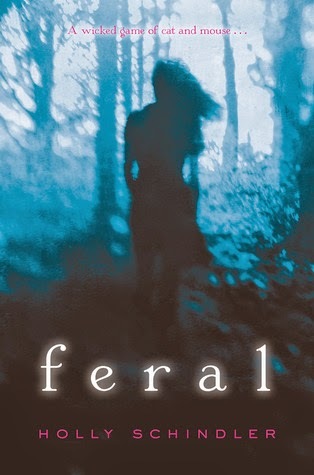 Thank you to Holly Schindler for providing me an ARC of Feral in exchange for my honest review. Have you had the pleasure of meeting Schindler's Feral? What did you think about Claire and the cats? This looks good as long as it is creepy and not flat-out scary horror stuff. I can't read most of the stuff you guys read for RIP. Becca Lostinbooks ... I would definitely not consider it a horror book at all. It is actually advertised as a psychological thriller and I definitely agree that this is more fitting!